Greetings from The 88 Project! We are bringing you news, analysis, and actions regarding human rights and civil society in Vietnam during the week of September 17-23. This week, four more activists were sentenced to prison terms in Vietnam. Do Cong Duong, who was arrested after filming a forced eviction, received four years in prison. Dao Quang Thuc, an online activist and peaceful protester, was sentenced to astounding 14 years in prison. And two Facebook users — Nguyen Hong Nguyen and Truong Dinh Khang — were given two- and one-year sentences, respectively, for their online postings critical of the government. It is possible that five more activists could go to trial on October 5, including Luu Van Vinh and Nguyen Van Duc Do. This week, we have an update on Nguyen Van Tuc’s health condition in prison, and we remember two other political prisoners, Tran Anh Kim and Nguyen Van Oai, on the anniversaries of their arrest and trial, respectively. Citizen journalist Ngo Van Dung, who filmed protests in June, is still being held in an unknown location more than two weeks after his arrest. Dr. Nguyen Quang A, a well-known pro-democracy activist, was prohibited from leaving Vietnam this week. Thirty-two members of the European Parliament released a letter calling for human rights improvements in Vietnam ahead of any vote on the EU-Vietnam Free Trade Agreement. Several civil society organizations have also voiced concerns about the agreement. In the news, read about the passing of Vietnam’s President, Tran Dai Quang, and continued criticism over the new Law on Cybersecurity. Please take action for Tran Thi Nga, one of the 14 female political prisoners currently imprisoned in Vietnam, who has received death threats in prison. Please consider donating to our campaign to amplify the voices of female activists and former political prisoners! Land rights activist and citizen journalist Do Cong Duong was tried on September 17 and sentenced to four years in prison, alongside three others. The court’s first instance trial was carried out from 7:30 to 14:00. The four defendants were Do Cong Duong, Le Thi Thanh Nga, Nguyen Van Vui, and Nguyen Van Trung, all prosecuted for “disturbing public order” under Article 318 of the 2015 Criminal Code. Except for Mr. Duong, the three others — Nga, Vui and Trung — admitted the accusations from the trial panel and were sentenced to three years, two years and six months, and two years and four months, respectively. Meanwhile, Mr. Duong was sentenced to four years, the heaviest judgment. Ha Huy Son, Mr. Duong’s defense counsel, claimed his innocence and argued that his behavior was just to take photos and observe the land acquisition by authorities. He had been arrested after filming a forced eviction in January 2018. There was no evidence from the investigative agency to prove that Mr. Duong opposed the person on duty or abetted anyone, even though they had accused him of “disturbing public order”. Mr. Duong wrote an appeal and sent it to the court. He also faces separate charges of “abusing democratic freedoms,” for which he will be tried in October, also carrying a maximum sentence of seven years. The Committee to Protect Journalists condemned the sentence against him. 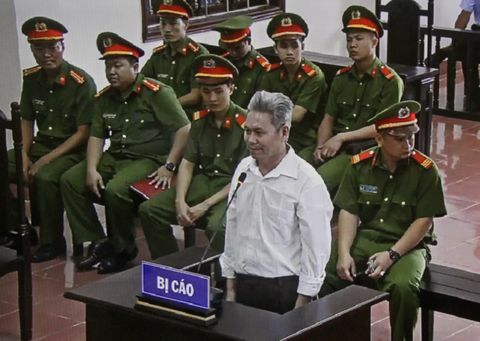 Former teacher Dao Quang Thuc was tried on September 19 in Hoa Binh province and sentenced to 14 years in prison under Article 79 of the 1999 Criminal Code for subversion. Thuc’s lawyer, Le Van Luan, said that the prosecution did not make an adequate case against Thuc, stating, “They showed only that he had tried to make connections [online] with others with similar views.” Thuc’s daughter remarked that he looked frail at trial, and that he had been severely beaten after his October 2017 arrest. Thuc had made online postings with social commentary and participated in protests over the environment and territorial disputes with China. This week, two more Facebook users were handed prison sentences in Vietnam for simply expressing their viewpoints online. Nguyen Hong Nguyen (above, left) and Truong Dinh Khang (above, right) were tried on September 22 under Article 331 of the 2015 Criminal Code for “abusing democratic freedoms.” In separate trials in the People’s Court of Cai Rang district, Can Tho City, Nguyen was sentenced to two years in prison and Khang to one year. Bui Thi Re, wife of political prisoner Nguyen Van Tuc, and their son, visited Tuc in Thai Binh detention center on September 20, 2018. They reported that Nguyen Van Tuc’s health is in bad condition after the appellate trial. In particular, his cardiovascular disease is getting worse, with such a high heartbeat and blood pressure that he feels he could faint at any time. In addition, other diseases, such as a degenerative spine (or the vertebrae of the neck) and hemorrhoids, cause him even more pain. However, his spirit of courage remains. He even encouraged his son and fellow activists to turn pain into action. Nguyen Van Tuc is a pro-democracy activist and member of the Brotherhood for Democracy, whose 13-year sentence was upheld on appeal on September 14, 2018. Luu Van Vinh is slated to face trial on October 5. His wife learned of the trial date independently, but no official date has been sent to the lawyers involved. Several others could also be tried along with Vinh, including Nguyen Van Duc Do, Phan Van Trung, Nguyen Quoc Hoan, and Tu Cong Nghia. All face charges under Article 79 of the 1999 Criminal Code for subversion. Vinh and his friend Do had both protested Chinese activity in the South China Sea and the toxic Formosa spill that began in April 2016. Vinh founded a group called the Coalition for Self-Determination for the Vietnamese People, which he had left a few days before his arrest. Three years ago this week, political prisoner Tran Anh Kim was arrested. He was arrested on September 21, 2015 and later sentenced to 13 years in prison. He had also spent over five years in prison from 2009 to 2015. A retired army officer, Kim has long been involved in the pro-democracy movement in Vietnam and has also been active in human rights and anti-corruption work. In May, he was hospitalized in prison for 20 days; he suffered from prostate inflammation. This week, we remember social and religious activist Nguyen Van Oai on the anniversary of his trial. On September 18, 2017, he was sentenced to five years in prison. He is a Catholic activist and blogger who has written on issues of labor rights and maritime sovereignty. Blogger Ngo Van Dung is still missing after his arrest on September 4 in Ho Chi Minh City. Since the arrest, his family has not been able to obtain information about his location, nor has the public received news on formal charges against him. Dung is a citizen journalist, who filmed the June 2018 protests in Vietnam over proposed special economic zones, and is a member of the pro-democracy organization the National Movement to Revive Vietnam. Two of its leading members, Vu Quang Thuan and Nguyen Van Dien, are currently serving eight and six and a half years in prison, respectively. Reporters Without Borders called on the EU to delay its vote on the EU-Vietnam Free Trade Agreement (EVFTA) in light of Dung’s case. On September 18, Dr. Nguyen Quang A, a leading voice in Vietnam’s pro-democracy movement, was barred from leaving the country to travel to Australia. In a separate trip, planned for early October, he hopes to travel to Brussels, to attend an EU hearing about human rights. He was stopped, searched, and questioned by security officers, and held for six hours total — even though his destination for this trip was not related to the EU hearing. He says this is the 20th time his travel has been restricted since 2014. The Unrepresented Nations and Peoples Organization also released a statement this week expressing concern over the potential impacts of the EVFTA on working conditions and workers’ rights, as well minority populations, in Vietnam, noting that “the monopoly of the Communist Party over politics threatens basic freedoms such as that of speech, press or religion; human right defenders, bloggers and journalists face physical assaults, harassment, threats; minorities such as the Khmer-Krom suffer repression and marginalisation.” They called on the EU’s leaders and members of Parliament to guarantee that the EVFTA includes protections for these groups of people. Christian Solidarity Worldwide has submitted its comments to the 39th UN Human Rights Council regarding the situation for freedom of religion in Vietnam. It criticized Vietnam’s Law on Belief and Religion for its restrictions of religious organizations and individuals and notes that all religious communities in Vietnam continue to be targeted with harassment, disruption of events, and even arrests. Read the full submission, here. Please take action with Amnesty International for Tran Thi Nga, an imprisoned labor rights activist. She is facing harsh conditions in prison, including death threats at the hands of her cellmate. Send a message demanding that Vietnam protect Nga from ill treatment, release her from prison immediately, and investigate the allegations against her cellmate. We hope to amplify the voices of powerful female activists and former political prisoners with our video interview series. Consider donating to the video campaign, here!